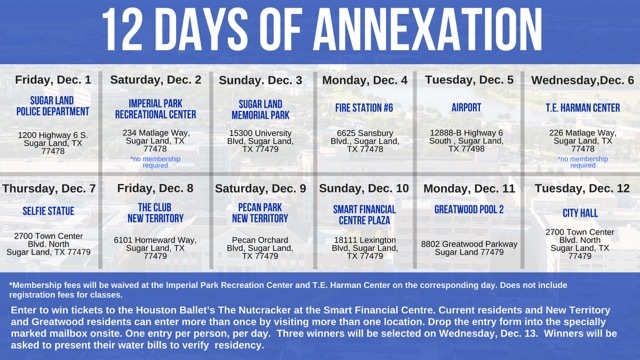 Sugar Land, Texas – The city of Sugar Land will host “12 Days of Annexation,” a series of days highlighting Sugar Land, New Territory and Greatwood locations while giving current and future residents a chance to win tickets to the Houston Ballet’s The Nutcracker at the Smart Financial Centre. From Dec. 1–12, current residents and New Territory and Greatwood residents can enter to win more than once by visiting more than one “12 Days” site. Entry forms and a specially marked mailbox will be located at each site. Three winners will be selected on Dec. 13. Winners will be asked to present their water bills to verify residency. The “12 Days of Annexation” includes locations such as the Smart Financial Centre Plaza, Sugar Land Memorial Park, Pecan Park and the Sugar Land Regional Airport. The Imperial Park Recreation Center and T.E. Harman Senior Center will waive membership fees on the designated date for those locations. Sugar Land is prepared and excited to welcome the residents of Greatwood and New Territory on Dec. 12. Funding for the expansion of city services to the annexed areas comes from service surcharges accumulated over 10 years from the residents of Greatwood and New Territory. Annexation will not increase costs, taxes or impact city services for current residents. The city is committed to excellence in the delivery of public services for Sugar Land residents, as well as its future residents in Greatwood and New Territory. The city encourages all current city of Sugar Land, Greatwood and New Territory residents to participate in the “12 Days of Annexation” contest. For information and helpful annexation resources, visit www.sugarlandtx.gov/annexation. General inquiries or questions regarding the annexation of the Greatwood and New Territory communities can be submitted to annexation@sugarlandtx.gov. You may also download the My Sugar Land app to your phone where you will find helpful information regarding the City of Sugar Land. The City of Sugar Land is currently in the process of updating the Parks, Recreation, and Open Space Master Plan. The Plan is updated approximately every ten years and establishes priorities for future Parks and Recreation facilities and activities. The priorities are established based on input by Sugar Land residents. With the future annexation of New Territory and Greatwood into the City we want to make sure the needs of our newest residents can be included in future plans. We would appreciate it if you would help with our efforts by taking a few minutes to provide your input through our online town hall survey. It is very quick and easy. The link below will take you to the on line town hall page on the City’s website. There are a number of question, and you can answer any individual question or all of them. The input received will be analyzed along with the other public input that we have received to help determine future needs.